Back in December, 3 lovely ladies (Kimberly, Gail & Yanni) asked me if I'd like to join them on their journey to win a trip to Princess Half Marathon via runDisney, New Balance and Zappos. Honored, I quickly agreed to join their team, the Persistent Princesses, and immediately we began posting a link to the contest page on all social media outlets so that our friends would vote for us. Kimberly was notified after Christmas that our team won the grand prize: a trip for 4 to Princess Half Marathon Weekend, race entries, Magic Your Way Park Hoppers, hotel stay and airfare. Magic! WOW. I was floored. Since the day the Glass Slipper Challenge was announced I wanted so very badly to attend Princess Half Weekend! Unfortunately, it was just not something I could afford this year. I pay for my own races, and everything that comes with it, out of my tiny waller. Flying from San Jose, CA to Orlando, FL just a month after Tinker Bell Half Marathon Weekend, plus race fees, hotel costs, meals, etc. - was just not in my budget. For me, this win is truly a fairytale with a happy ending. Since I ran Tinker Bell Half last month, I qualify for the pink Coast to Coast medal this year! I look forward to running the races this month, enjoying every magic mile & earning all the bling! I will continue to blog about the contest experience and the entire Princess Half Marathon Weekend right here, so stay tuned for more magic! 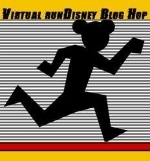 This post is part of a Princess Half Marathon Blog Hop. Please click the image below to see other posts related to this fabulous race weekend!